R/V Falkor is equipped with a suite of the most advanced multibeam sonar systems available to oceanographers. 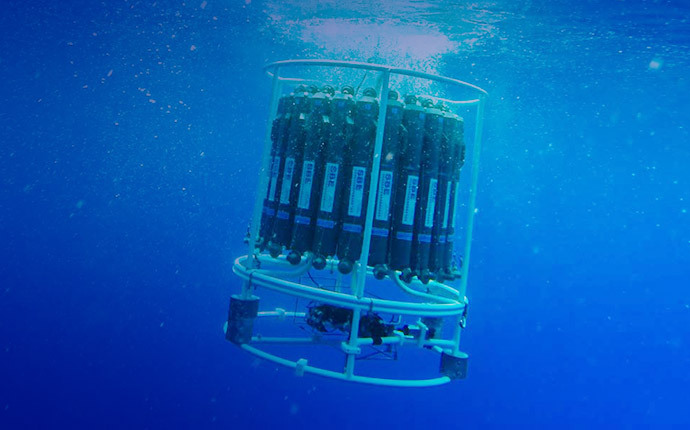 Other Falkor sonar systems are designed to characterize fish and plankton assemblages, to measure currents, and to create images of the rock and sediment patterns found beneath the seafloor. 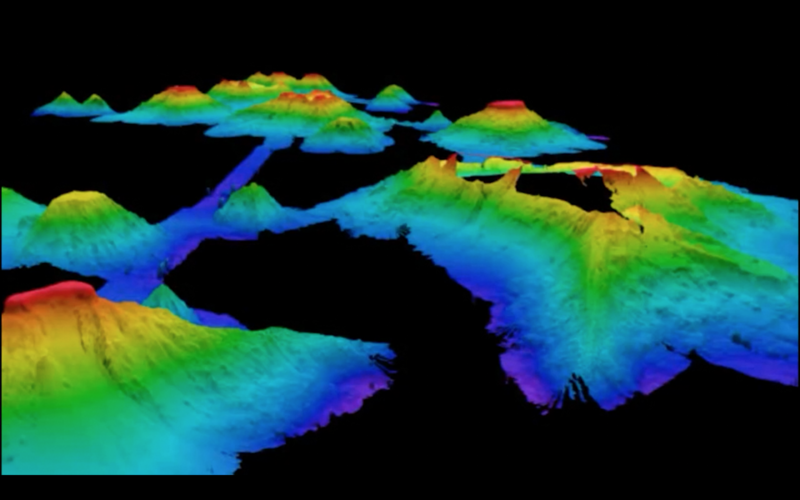 Bathymetry studies the depths and shapes of underwater terrain. In other words, it is the underwater equivalent to topography. The ocean’s floor is as complex as it is deep: huge trenches, walls, flatlands and seamounts fill the seascape and have a direct impact on the water bodies above them. 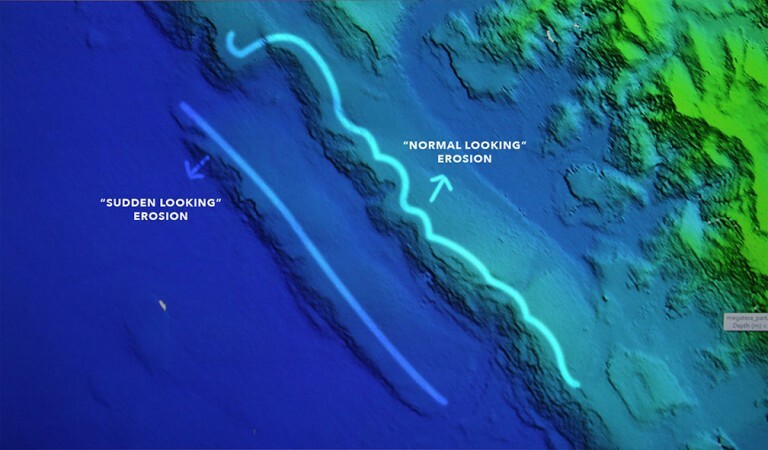 By conducting a multibeam sonar survey similar to a medical ultrasound, scientists are able to image the sea-bottom. Bathymetric data can be applied in several ways, from water transportation or biological oceanography to the study of climate change. 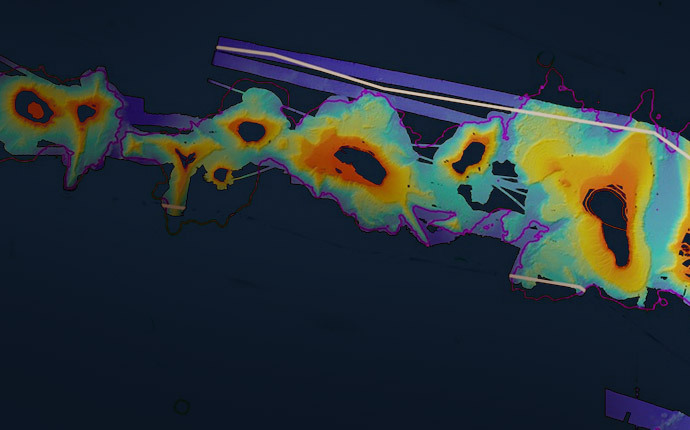 Incoming data from the multibeam sonar over Northwest Rota. 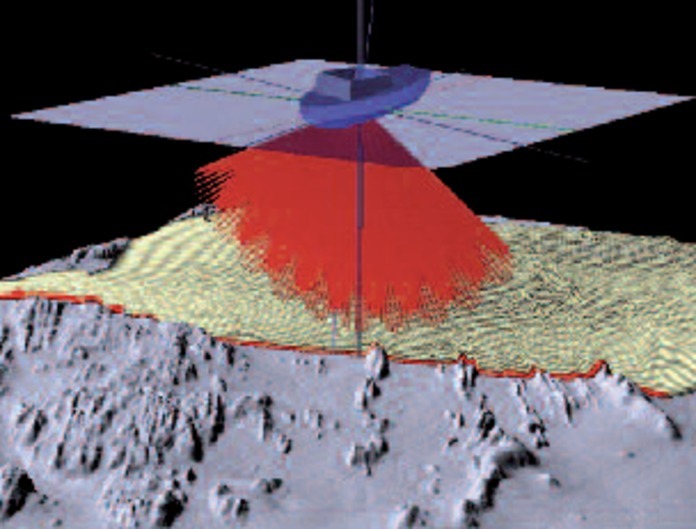 What is multibeam mapping and what does it do? Falkor’s advanced Kongsberg multibeam sonars transmit sound pulses, or ‘pings’, that bounce off the seafloor and return to the ship. 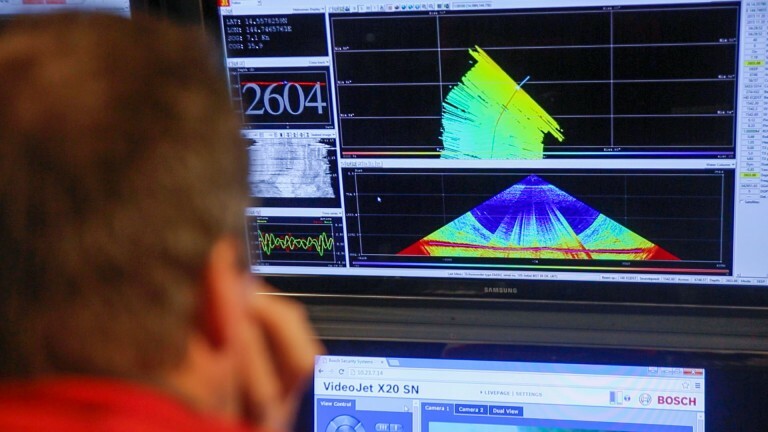 The sonar systems calculate the time each pulse takes to reach the seafloor and return, then translates those times into water depths, allowing us to uncover the bathymetry below us. 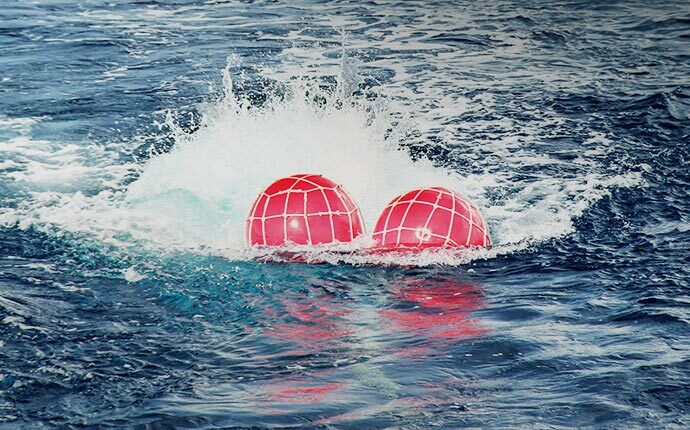 The speed, or velocity, of the pings depends on water temperature and salinity, which we regularly measure. 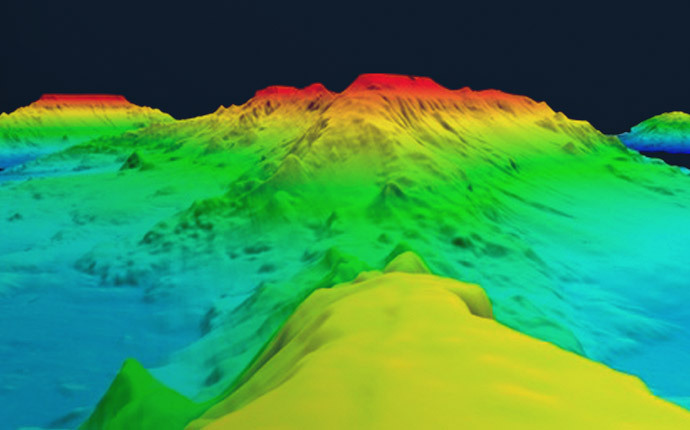 One sonar system is optimized for producing high-resolution maps of the bottom at depths down to 8,000 meters. 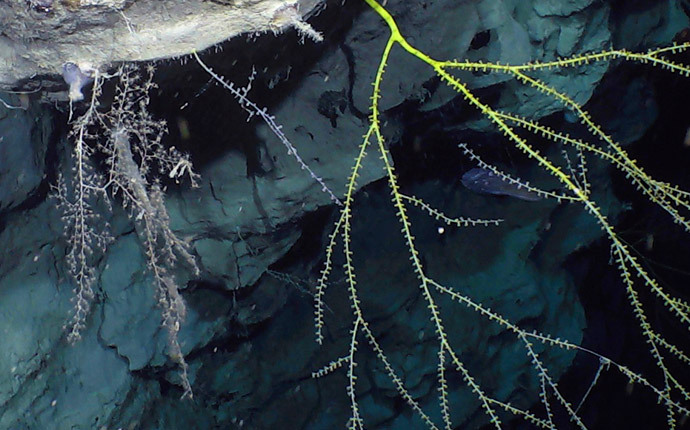 Another system works best in shallower depths of less than 2,000 meters, such as those found on continental shelves. 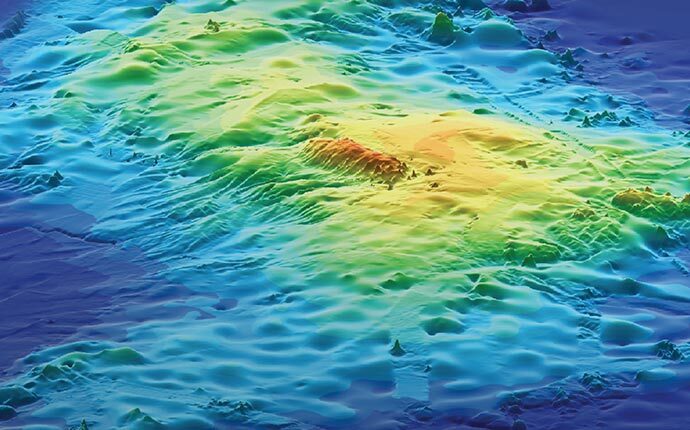 Both are known as multibeam systems, which means they put out a large fan of sonar beams, making it possible with a single pass to image swaths of seafloor that are several kilometers wide. The deep water multibeam sonar on the R/V Falkor is an EM302 which operates at 30 kilohertz. 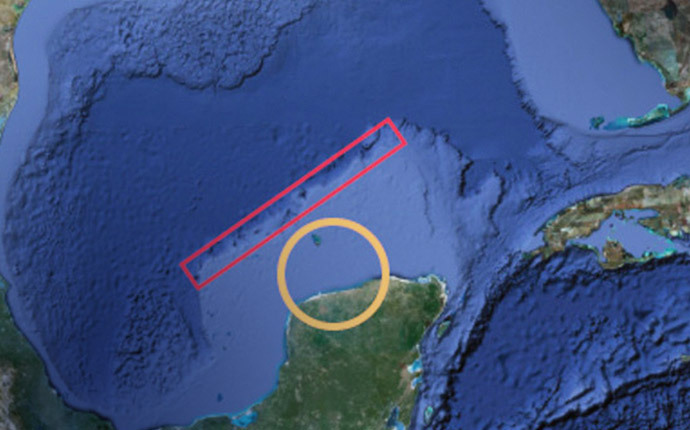 The continental shelf depth system is an EM710 that operates at 70 to 100 kilohertz. 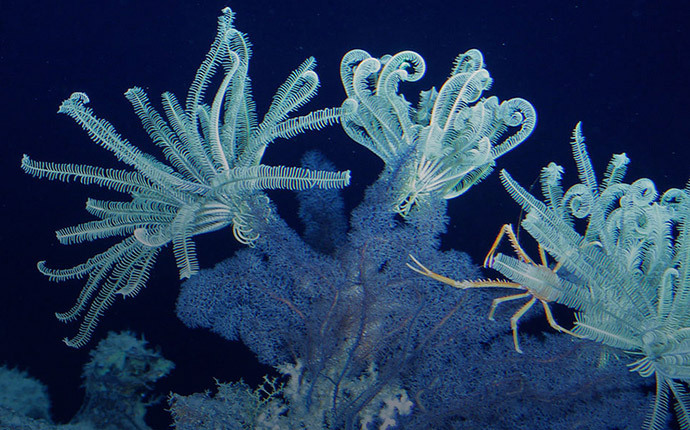 Collectively, the optimized depth ranges for these systems encompass about 90 percent of the world’s seafloor. A view of the sonar gondola beneath Falkor's bow. One of the greatest challenges for sonar systems on most ships are bubbles. As a ship moves faster, or encounters heavy seas, bubbles formed at the surface wash down the hull, where they can interfere with the sending and receiving of sonar signals. 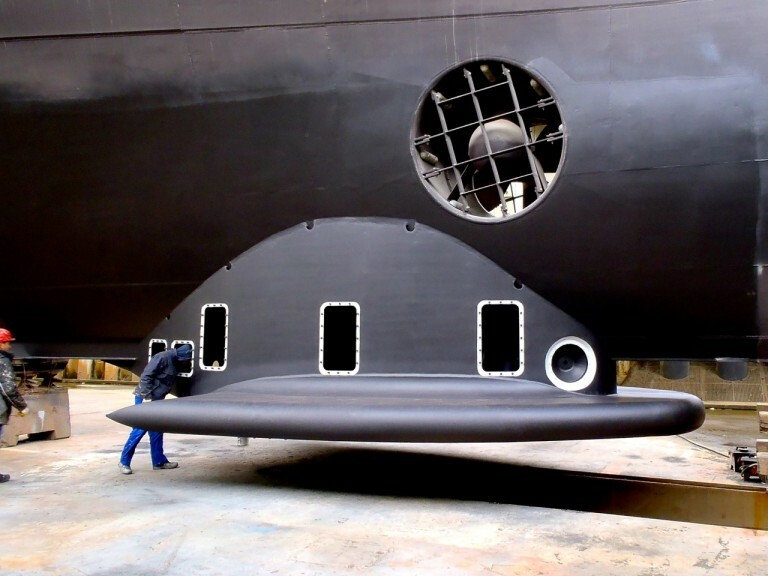 To overcome this issue, Falkor’s sonar systems are installed on the bottom of a streamlined platform called the gondola fitted beneath the ship’s bow. The sonar systems are embedded into the bottom surface of this gondola, where they are isolated from bubbles, which pass between the hull and the top of the gondola. This allows Falkor to run mapping surveys at up to about 14 m.p.h. without bubble interference, though mapping is generally done at about 9 m.p.h.